As nation readies for first elections without Nelson Mandela, top prosecutors are attacked for letting officials get away with murder. Literally. Richard Mdluli, head of the crime intelligence section of the South African police, was first charged with murder, attempted murder, intimidation, and the kidnapping of a man who married his former lover. Six months later came money laundering charges, followed by charges of fraud, theft, and corruption.Then, in the midst of the brewing scandal, Mdluli wrote a letter to South African President Jacob Zuma and to his police bosses: “In the event that I come back to work, I will assist the President to succeed next year.” Mr. Zuma was facing re-election within his party. Charges against Mdluli were then summarily dropped by the prosecutor. Nor was that all: Mdluli was reinstated as chief of his powerful section within the South African Police Service – raising ire and intense suspicion. South Africa, to be sure, is hailed as a democratic beacon on the continent. It features a fiercely independent judiciary and an internationally celebrated constitution. But at the turn of a new year, the nation’s most visible prosecutors — whose integrity is crucial to public trust — are being accused of flagrant bending to political will and patronage. South Africa faces its first elections without the symbolic figure of Nelson Mandela, and the standing of institutions like the judiciary are getting more scrutiny and criticism for a lack of policing zeal. In the Mdluli case, the judicial establishment reacted both with revulsion and speed. Respected legal figures felt the nation’s legal and crime-fighting capability were at stake and being seriously undermined by cronyism. The stinging rebuke of South Africa’s prosecutors and their official body, the National Prosecuting Authority (NPA), is the latest in a series of cases where personal connections to Zuma have resulted in the avoidance or near-avoidance of judicial proceedings. Not only did Judge Murphy order police to resume proceedings against Mdluli but, in an unusual twist, a different police section, the Directorate for Priority Crime Investigation, filed a complaint against the prosecutor responsible for dropping the charges against Mdluli. “Defeating the ends of justice” is how the complaint is worded. The NPA, the central prosecuting authority, is often blamed for enabling police corruption. Critics say the problem comes from the top of the organization, which is headed by political appointees. 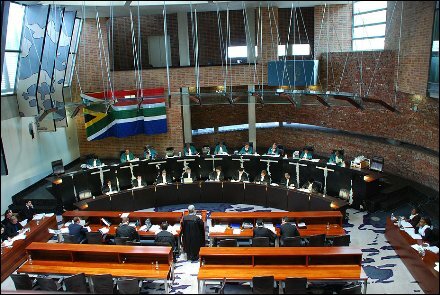 Last year the Constitution Court took the rare step of invalidating the tenure of Menzi Simelane, the former head of the NPA. His appointment by Zuma was described as “irrational” since the president appeared to ignore clear evidence of Mr. Simelane’s dishonesty. Zuma himself had 783 counts of corruption against him dropped a few years ago. A special federal investigating unit estimates that South Africa loses about $3 billion annually to corruption and fraud. Recently, Similane has been accused of involvement in efforts to block a probe into what is known here as “the Arms Deal,” a multi-billion dollar munitions-purchasing scandal that has touched many top officials. And that isn’t the end of the story: Simelane was replaced as the nation’s chief prosecutor by a woman who was suspended from the NPA for trying to block the prosecution of a disgraced former police commissioner. The commissioner, Jackie Selebi, was later sentenced to fifteen years in prison for taking bribes. After less than a year in custody, Mr. Selebi was released on medical parole. There is no shortage of cases where prosecutors have shielded powerful officials and politicians. Last year charges were dropped against two political leaders in Kwazulu-Natal province, Peggy Nkonyeni and Mike Mabuyakhulu. They were suspected of brokering deals to sell water purifiers and other equipment at wildly inflated prices. The NPA’s acting chief in the province, Simphiwe Mlotshwa, initially sought prosecutions against all involved. But he was quickly replaced by a prosecutor who withdrew all charges. The Mdluli case, however, is a benchmark for many of just how far South Africa’s criminal justice institutions have fallen. 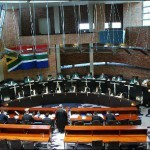 “There is no political will to subject politically-connected people at the highest levels of government to the criminal justice system when there are allegations of wrongdoing,” writes Gareth Newham, head of the Crime and Justice Program at the Institute of Security Studies, about the Mdluli and similar cases. Steven Powell, head of forensics at the law firm of Edward Nathan Sonnenbergs and a former NPA prosecutor who successfully took on the high-profile corruption case of Schabir Shaik, a Zuma associate, says that interference and lack of accountability are shredding confidence in South African institutions. The loss of confidence, says Mr. Powell, is felt especially among the South African public. Some prosecutors speak of deep demoralization. While much institutional talent remains distrust of the leadership and its motivations is taking a toll. But there is some hope and some guarded feelings about the possibility of change. After extensive delays at the end of August, Zuma appointed a permanent replacement to lead the NPA. While the new director, Mxolisi Nxasana has no prosecutorial experience, and is relatively unknown, he also appears to be free of scandal. Lawson Naidoo, executive secretary of the Council for the Advancement of the South African Constitution, which sued Zuma to force him to choose a new director, struck a diplomatic tone when the name was revealed and asked for more information. “We believe that the support of the public and other role-players will assist [the new director] to execute his constitutional responsibilities to strengthen the NPA and to prosecute without fear, favor or prejudice,” Mr. Naidoo said. Mr. Nxasana, the new director, will have his work cut out for him. In October the NPA sought leave to appeal Murphy’s judgment in the Mdluli case, saying the judgment went too far in telling prosecutors what to do. Yet in early December, the Pretoria High Court said the appeal could go forward, a ruling that extended to Mdluli and South Africa’s national police commissioner as well. Since then, the story has gotten stranger. Mdluli lodged a complaint against two senior NPA prosecutors and an investigator, saying the trio conspired to either frame or murder him. One of those accused is Glynnis Breytenbach, a top NPA lawyer who claims she was suspended from her position a few years ago for pressing forward with the Mdluli case. Breytenbach was later cleared of 15 disciplinary charges; her case became a rallying point for good government advocates and is bringing close attention to how Nxasana handles the Breytenbach saga. Reporting on this story was supported by a grant from the Ford Foundation.